When Carl Kah started his small regional company, K-Rain, almost 45 years ago, little did he realize that it would grow to become a major force, selling its products worldwide. Along with the pride Kah has in the products he’s designed and the patents he holds, his greatest joy is that all his children are involved in the company. Carl graduated from Georgia Tech in 1953 with a degree in chemical engineering. He took a job with Humble Oil Company (now Exxon) in Houston, Texas. He liked the job and thought he would make it his career; however, the draft was still in effect and when he applied for a deferment it was denied, and he was called up to serve his country. With the Korean War winding down, he was assigned to the Corps 82nd Airborne Division. “After leaving the service, I spent the next 15 years working for United Technologies on applied research and advanced propulsion. During that time, I developed the idea for an indexing valve. United Technology got a patent on it and then decided that they didn’t want to stray that far from their core business. I told them I wanted the patent and they assigned it to me.” The year was 1972. “I thought to myself, ‘Now I’m all set; I’ve got a good job with a good salary,’ and I was selling my indexing valve on the side. I formed my own company, called it K-Rain,” Carl said. Two years later, in 1974, he left United Technologies and devoted his time to K-Rain. For the next 12 years, the fledgling K-Rain company was selling its index valve and adding new rotors to the line. Carl was happy with the progress he was making, the ideas he was developing, and the patents he was obtaining. Carl’s three children grew up in the business. As kids, they would hear talk about the business at the dinner table on Saturdays, Sundays and holidays. They also heard about new products their dad was developing, or about filing for another patent. Daughters Gretchen and Debbie grew up, got married and were raising their children. Son Chip graduated from Florida State University, Tallahassee, and took a job with the United States Agency for International Development (USAID), a part of the State Department, and moved to Central America for a six-month stint. Following that, “I had an opportunity to become a partner in a real estate development in Utah,” he said. Chip moved there and spent a year working on the project, when he realized that it would take much longer than he was willing to give to build it out. “In 1986, when my father offered me a job, I took it and moved back to Florida. I was 25 at the time.” Shortly thereafter, Chip got married. Now, 31 years later, Chip Kah is president of the company. Along with his father, Carl, they are creating and developing new products. Carl is proud of the many patents he holds, now numbering more that 100. Gretchen, who has been living in the San Francisco area, joined the company in 1995, and is very active handling sales on the West Coast. 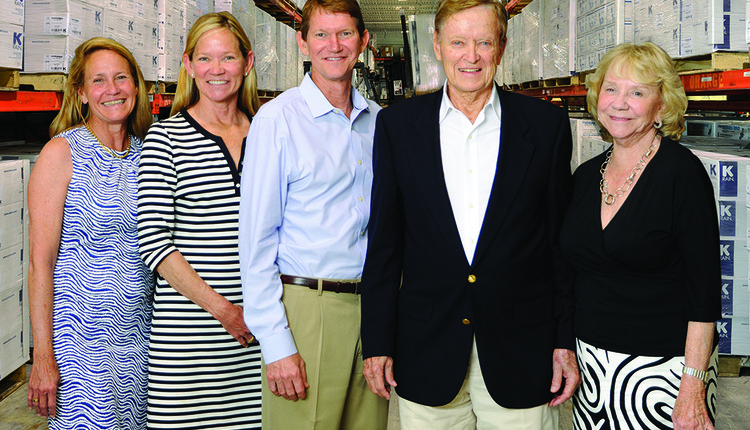 Debbie, who went to law school and worked as a tax attorney, is also in the family business. She handles intellectual property and human resources. Carl’s wife, Shirley, had been involved working in the accounting department in the early days. Although she has not been active recently in the company, she continues to be a strong advocate of keeping the family business growing. Christopher Kah, 28, a finance major, graduated from the University of North Carolina with a degree in business administration. He joined a small venture-capital company and then another, but wanted to sink his teeth into something he felt would be more substantial. “I told him, our company is strong and there’s a lot of opportunity for growth, and asked him to join us,” said Chip.